Dental Trauma Among Our Children | Why Do My Teeth Get Discolored? In most dental offfices, after the hygienist cleans your teeth, the dentist comes in to examine your teeth. Then, out of nowhere, she starts rattling off alpha-numeric terms, like 3MOD, 5DO, 13MBD, and so on. The dentist is not looking a bowl of alphabet soup, but, rather using a form of dental shorthand. 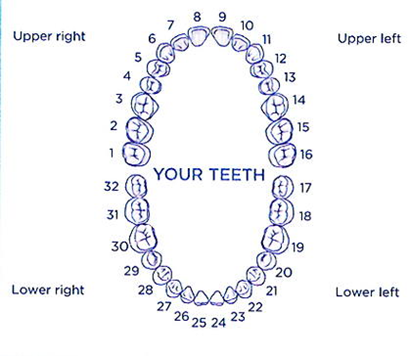 The numbers represent which teeth have cavities or other problems. Tooth number one is the upper-right third molar or wisdom tooth, the farthest tooth back in the mouth. Tooth number 16 is the upper-left third molar, and so on. So, teeth #1 - 16 are on your upper arch, and teeth #17 - 32 on your lower arch. The letter part of the code refers to different parts or surfaces of the tooth. An "M" mesial or "D" distal is the front or back surface of the tooth, respectively. An "O" occlusal, is the top or biting surface of a back tooth (molar or premolar), and "I" incisal, is the biting edge of front teeth (incisors and canines). A "B" buccal, is the surface of the tooth towards the cheek, and an "L" lingual is the surface of the tooth towards the tongue. So, if the dentist says number 3MOD, you'll know that you have a cavity on your upper right first molar, involving the front, top, and back parts of the tooth. So next time you visit our office, we hope you will have a better understanding of the “language” spoken regarding your care. Please remember, we are always here to answer questions about your dental health. We cannot tell you what a pleasure it has been to serve this community for over 35 years. We thank you for referring your friends and family to our office, and do not take your trust for granted. One of the ways we say thank you is giving back to our community. For the last 25 years, we have visited the local schools and talked to them about “what to expect when you visit the Dentist”. It’s fun for both the kids and us. If you share our belief in quality dentistry – the best dentistry we can possibly do – then we’ll find a way to make it a part of your life.